$10.50/gal. $18.50/ 2 gal. 3-4 ft. Varieties priced by specimen. Cercis canadensis. The redbud is one of the most beautiful small trees to grace our forest understory. A small tree in the Caesalpinacaea (related to peas and honey locusts, it is a legume) with a sturdy upright trunk which divides into stout branches that usually spread to form a broad flat head. It grows well in New York State, New Jersey and southward, and found on rich bottomlands throughout the Mississippi River valley; will grow in the shade and often becomes a dense undergrowth in the forest. Very abundant in Arkansas, Oklahoma, and eastern Texas. 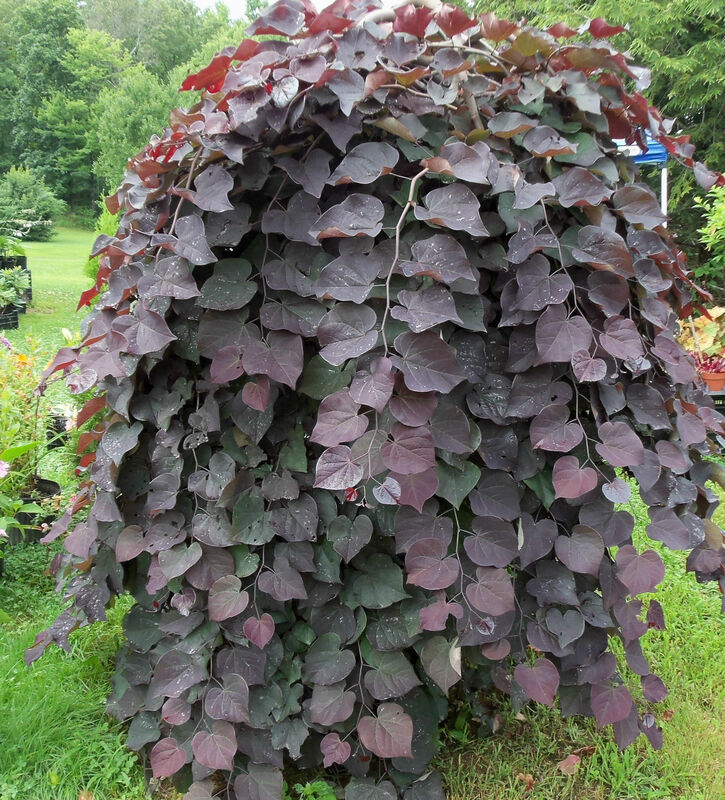 Hardy far north, it grows rapidly and is a lovely ornamental tree. It is sometimes known as the Judas tree, ostensibly because it resembles the tree that Judas hung himself in (It is not native to the middle east). It has it's northern range of growth in southern New England. 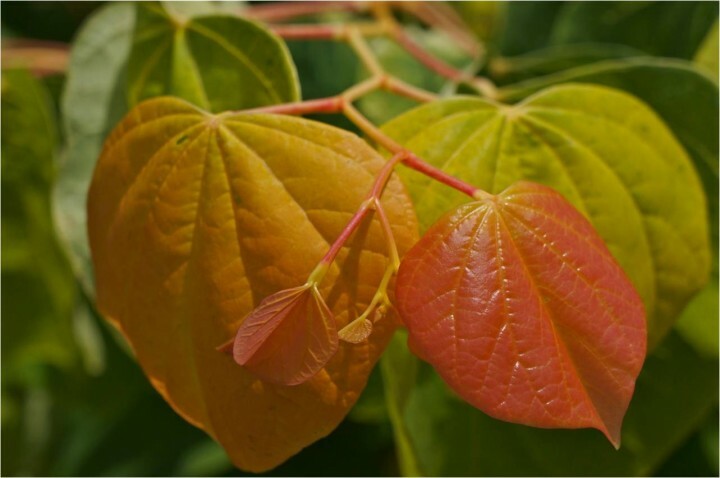 In addition to the species, we have four varities available, including the deep maroon-leaved "Forest Pansy", the deep red foliaged and pendulous "Ruby Falls", "Rising Sun", a variety with peachy-tangerine arching foliage that becomes chartreuse, then deep green, and "Ace of Hearts". 'Ace of Hearts' is distinguished by its (a) compact habit, (b) semi-glossy, heart-shaped leaves on zig-zag stems, and (c) dense dome-shaped canopy which typically requires no pruning. It typically grows as a single trunk tree (average diameter of 4") to 12' tall and to 15' wide. Clusters of tiny, reddish-purple, pea-like flowers bloom for 2-3 weeks in early spring (March-April) before the foliage emerges.